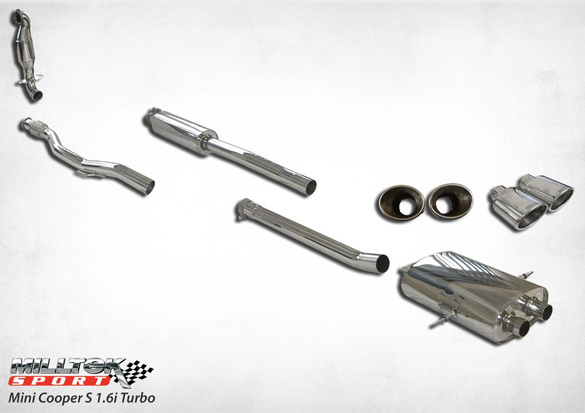 Milltek Sport exhaust systems for the Mini Cooper S are quickly becoming the owner's choice in performance exhaust for Mini. Manufactured in the UK buy the premier aftermarket exhaust manufacturer for Audi and VW automobiles. Milltek has significant experience in supplying exhaust components that perform while being civil at the same time. Milltek has the experience of producing superior systems for German-designed cars whilst also having the UK pedigree to deliver what a Mini Cooper S owner would expect. This system has a great sound without drone on the highway. Bolts directly onto the factory downpipe so no cutting or welding is required. This system has several bolt together joints making several adjustment points to make it fit just right on your MINI Cooper S and Cooper S Coupe. New option for resonated or not. Milltek recently added the option to not have the front resonator. If you select the non resonated exhaust it will be a little louder, but also a lighter exhaust. The resonated system is quieter if you are concerned about noise. If your MINI has the JCW rear bumper you will have to order the Round Tip option, the Twin Oval Tips will not clear the bumper without melting it. WMW Recommends the Round tips as the better option in all cases. Downpipe must be purchased seperately.